Source: Edgecombe County Memorial Library, Tarboro NC. Edgecombe County Memorial Library is proud to host an appearance by the ECU Medical Readers’ Theatre Company. The group will be performing a dramatization of the “The Enemy” by Pearl S. Buck. “The Enemy” takes place in World War II Japan and raises issues of racism and conflicting physician duties to profession and country in wartime. There will be a discussion following the performance. 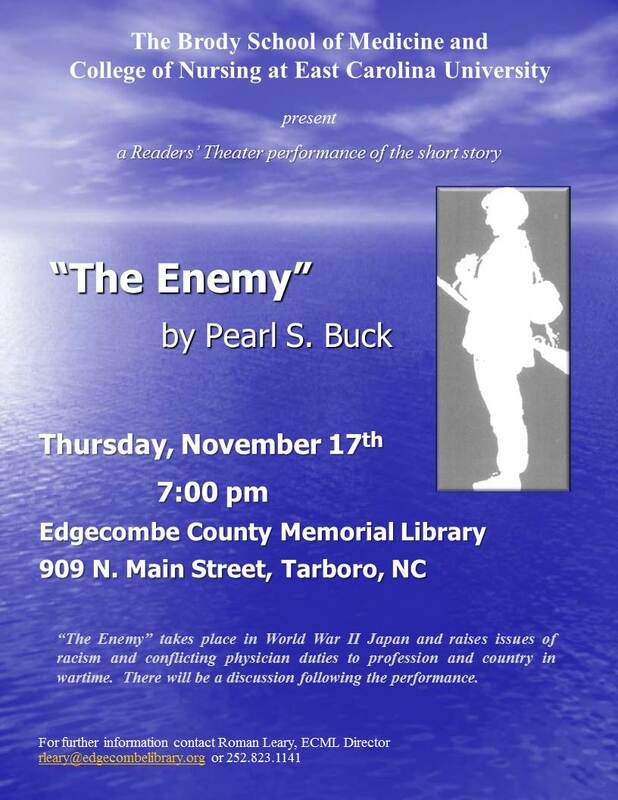 The performance will take place on Thursday, November 17, 2016, at 7pm, in the Edgecombe County Memorial Library is located at 909 N Main Street, in Tarboro, North Carolina. Christine Ward plays Yumi. A second-year medical student, Christine is originally from New York. She likes reading and writing, and walking her dog, Walter. Darlene Keene plays Hana. A practicing physician in general pediatrics here in eastern North Carolina, Darlene has been involved in the Readers’ Theater Program since its beginning. Dr. Keene has also received training in neonatology. Brandon Yates is in the role of Sadao. Brandon is a first-year medical student from Raleigh, NC. He has a previous background in theater and is excited to have the opportunity to participate in Reader’s Theater! Brandon’s hobbies include theater, volleyball and basketball, dancing and singing. Richard Jordan plays the General, and the Sailor. Richard, a first-year medical student, hails from Statesville, NC, and is the first member of his family to receive a professional degree. He has a deep connection to bluegrass and old-time music, and is an avid clawhammer banjo player. Richard hopes to pursue family medicine. This East Carolina University (ECU) presentation has been coordinated by Dr. Todd L. Savitt, Dr. Melissa Schwartz Beck, and RN Bob Green. Dr. Todd Savitt will be attending the performance and will lead a discussion afterward. This presentation is part of ECU’s Readers’ Theater program sponsored by the Department of Bioethics and Interdisciplinary Studies at ECU’s Brody School of Medicine and by the ECU College of Nursing. The purpose of the Readers’ Theater program is to foster a closer relationship between the health care professions and the public they serve. Performances are short plays or adaptations of short stories that focus on timely medical issues. Following each performance, a humanities scholar moderates a discussion between the cast and the audience about questions raised by the story. The discussion provides an arena for examining personal values and assumptions relating to ethical and social issues in medicine. For further information, contact Roman Leary, ECML Director via email or call the library at 252.823.1141. Source: EdgecombeCounty Memorial Library, Tarboro NC. 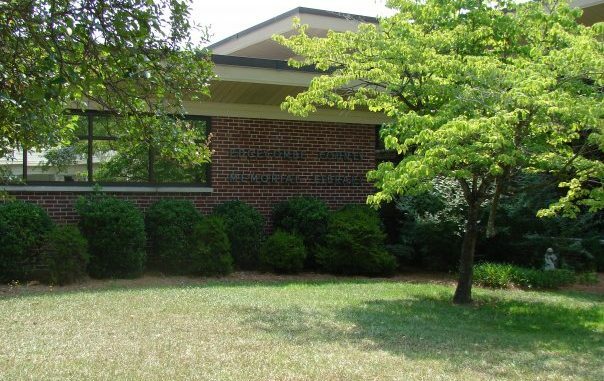 The first public library for Edgecombe County was created in the 1920s by the Edgecombe Public Library Association. The first members paid annual dues of $2.50. Started inside the First National Bank, the library was opened to the public with 681 books, eight magazines. and two daily papers. In the fall of 1929, the library was moved to the Edgecombe Building and Loan Association and books made available to all Edgecombe County residents without payment of annual dues. Some funding was provided by the town at that point. The library that is at its current Tarboro location was completed in March of 1955. It was renamed the Edgecombe County Memorial Library in memorial to the veterans.